Benthic marine habitats such as coral reefs, seagrass meadows and kelp forests are environments that have significant economic value worldwide and are expected to face increasing pressures from human impacts such as urban development, fishing and climate change. Long-term monitoring of these habitats provides a means for detecting and quantifying changes in the distribution and abundance of different species, aiding our understanding of human impacts. This project aims to develop algorithms and methods required to enable robotic platforms to perform repeatable, high-resolution surveys of marine habitats. Current research is focussed on developments in data processing of multi-year repeat survey imagery and other map data for precision automatic registration and change detection. Change detection is made challenging by the lack of precise geo-registration accuracy (errors of +/-5m) with respect to cm-level changes that can occur across multiple years in habitats such as coral reefs. Registration of data across multiple years must be performed using the map and image data itself, which is further complicated by changes in the benthic coverage and assemblages that occur over multiple temporal and spatial scales. Registration of map data and images across multiple years is complicated by changes in the benthic coverage and assemblages that occur over multiple temporal and spatial scales. Recent research is studying new methods for accurate and robust registration of imagery mosaics collected over multiple years using techniques such as mutual information optimisation. These methods provide robustness to changes in the colour and brightness of objects in an underwater scene. 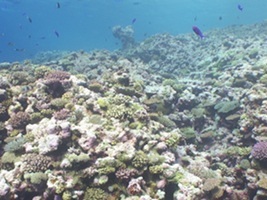 Results are presented from field data collected over coral reefs near the Abrolhos Islands in Western Australia between 2010 and 2011. Coral in the area exhibited signs of bleaching between the years, and the registration techniques were able to accurately co-align images in the face of these changes. 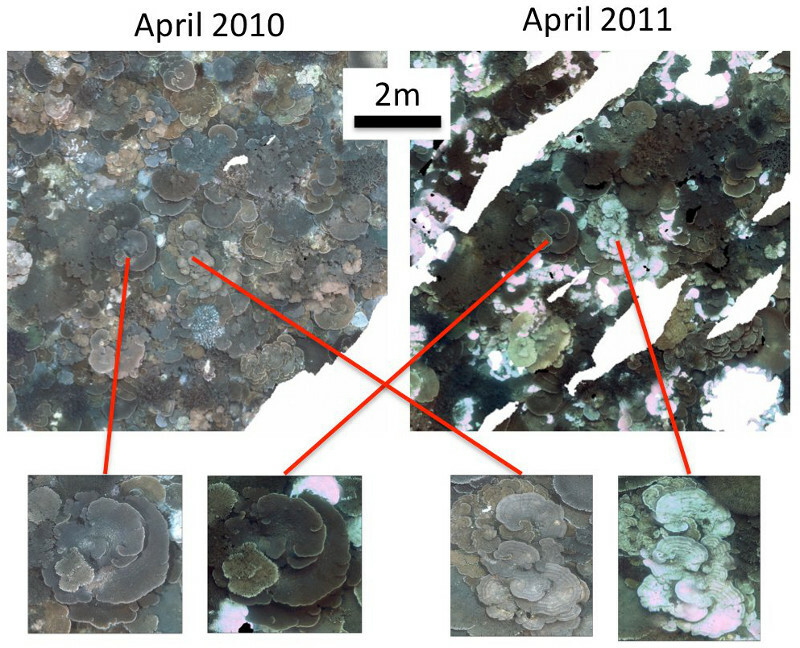 Co-registered coral imagery mosaics across a 12 month period (April 2010/April 2011) from the Abrolhos Islands, WA, Australia with highlighted sections of both un-affected and bleached coral, co-registered using mutual information optimisation of the mosaic greyscale images. 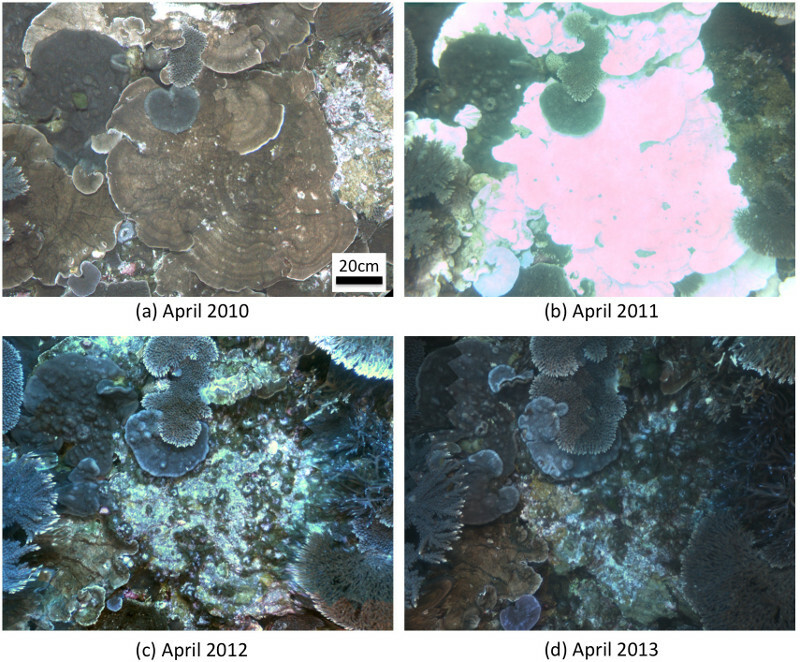 Shown are four repeat views of coral colonies from April 2010, April 2011, April 2012 and April 2013 at the Abrolhos Islands, WA, Australia. The 2011 image (b) is an actual image collected by the Sirius AUV. The images in 2010, 2012 and 2013 (a,c,d) are all reconstructed images that are built from a collection of images from different perspectives and “stitched” together to produce an image that looks like it was taken from exactly the same perspective as in 2011. M. Bryson, M. Johnson-Roberson, O. Pizarro and S. Williams, “Automated Registration for Multi-year Robotic Surveys of Marine Benthic Habitats”, IEEE/RSJ International Conference on Intelligent Robots and Systems (IROS), Tokyo, Japan, November 2013.